Where can I ask for free proofreading? I know that proofreading is prohibited in this site. However, I'd like to ask if there are free online websites to do that. I remember once there was a website where I can help people in Spanish/Portuguese and they help me in English. I attempted searching on Google, but I didn't find anything. Suggestions are highly appreciated guys. I have a few very reliable sources. Lang-8.com is a good volunteer-based proofreading portal. It works on the principle of reciprocity: you proofread a guy or gal's posts in your language, they proofread writing in theirs. Furthermore, the more you've proofread, the higher your reputation is, and this also attracts readers and proofreaders. where you can post your text and people will give you advice even beyond simple proofreading. The site also has an internal messaging system, which can be helpful for one-on-one conversations about your writing. I don't know how many "editors" avail themselves of that facility. I used to. Give Typely a try. It is a free proofreading application that you can use right away. It has been featured on the frontpage of many news aggregators and is already stable and strong. Our main focus is not grammar but we do catch a lot of mistakes while performing over a thousand checks on any given document. 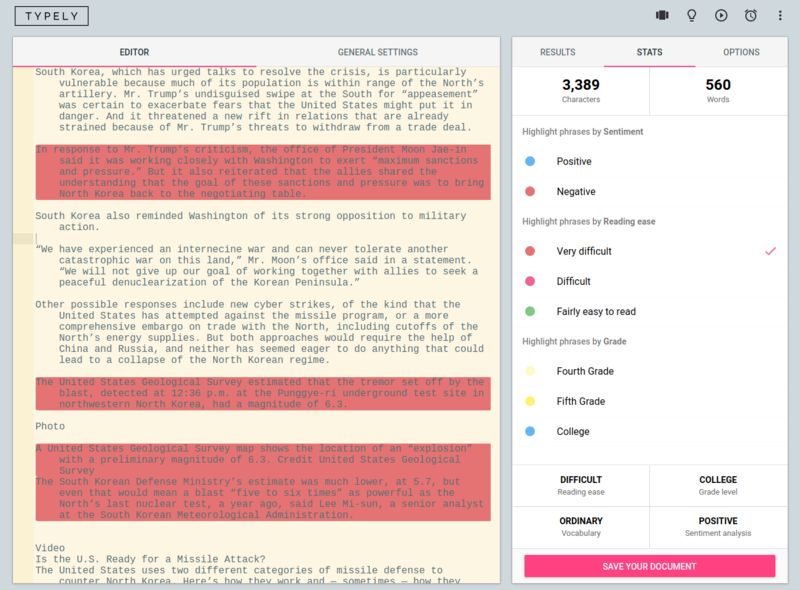 You can also check your writing’s sentiment, required education for audience (grade) or reading ease. Grammarly is a Chrome extension and website that can check grammar for you. Note that it does not work in Google Drive apps. Finally, it can store documents on the webpage on your account. Not the answer you're looking for? Browse other questions tagged discussion resources online-resources . Where can I get a small text proofread? Where can I get my English corrected (online)? Is there a place i can send my English writing so they can correct it for me? Do you know some sites or resources to checking text for errors? Is there a thesaurus which takes more than one word as an input?